Although we had a great evening at our family cookout this past Monday, I have to say those events should really happen more often on the weekends when there’s less of a curfew. Thanks a lot, full time job! At any rate, we had almost all the siblings together and enjoyed too much food as usual – burgers, sweet potato fries, caprese salad, watermelon, veggies with hummus and this California Spaghetti salad! She doesn’t wear dresses much anymore, but she is still very into art and has upgraded from coloring to painting and occasionally still makes artwork just for us! Since this is a food blog, I’m obligated to tell you about the delicious red velvet cake we had at the cookout for her birthday! Topped with homemade cream cheese icing of course! She’s typically an ice cream girl, but when it comes to cake red velvet is her favorite. Girl still has some learning to do about the yumminess of vegetables, but she knows where it’s at when it comes to dessert! And now that I’ve posted that photo, is anyone really still interested in pasta salad or are y’all drooling over cake, thinking about a trip to the bakery, wondering if any of them deliver or possibly half contemplating checking your kitchen cabinets to see if you have the ingredients to bake your own? It’s okay, the California Spaghetti salad will be waiting for you when you get back and need a dose of veggies to even the playing game! or field? The saying goes something like that! I love the crunch and color this particular mix of veggies adds to the salad! The dressing is a very simple mix of Italian salad dressing (Wish Bone is my go to), Parmesan cheese, sesame seeds, celery seed (confession: I didn’t have any on hand so I excluded this ingredient), paprika and garlic powder. I added all the dry ingredients to a large measuring cup with a spout first and then poured in the dressing and whisked to mix it all together. As with any pasta salad, it’s best to make it a few hours early so it can marinate in the fridge before serving and soak up all the flavor! There’s only a little over a month of summer left this year! Plan some cookouts, get outside, stay away from the Halloween aisles at the stores and make this yummy pasta salad! Enjoy! A summertime staple perfect for cookouts! Wash and prep all vegetables and set aside. Cook pasta according to directions on package, rinse under cold water, drain and add to a large mixing bowl. While the pasta is cooking make the dressing by adding the Italian dressing, cheese, sesame seeds, paprika, celery seed and garlic powder to a measuring cup and whisking until well mixed. Add the vegetables to the spaghetti, pour dressing over top and gently mix to combine. Cover and refrigerate for at least 3 hours before serving. Recipe found from therecipecritic.com ! 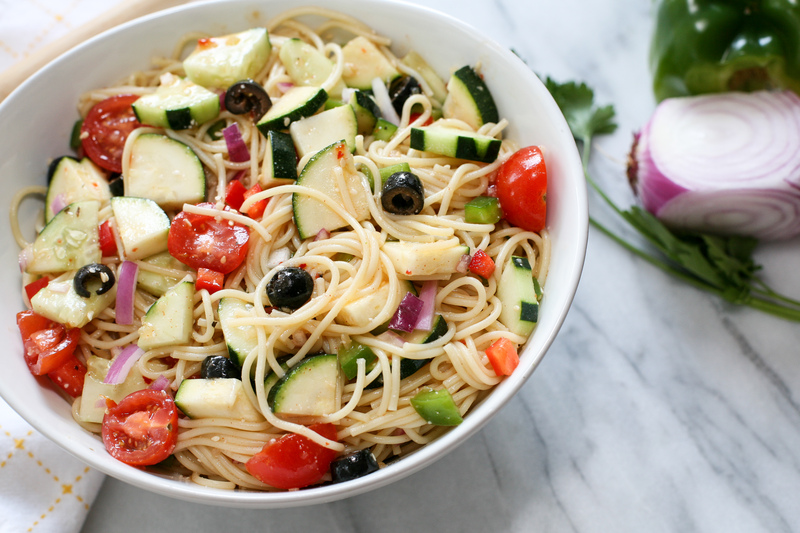 This entry was posted in Lunch, Recipe Book, Sides and tagged california spaghetti salad, cookout recipes, easy side dishes, pasta recipes, pasta salad, simple summer recipes, spaghetti salad, summer recipes, vegetarian. Bookmark the permalink.